a Magic Eraser. Made of compressed plastic. A central tool of my trade when I cleaned houses for money. Its abrasive surface helped me get through jobs quickly, reconfigured my job fees into something more livable, and left me with an abiding respect for the things a sponge might tell us about dirty and clean, and the work surrounding each. In what follows, a sampling. Opening line proposing exchange: “Can I ask you a weird question?” Used for dishes in shared staff space. Not much in the way of distinguishing marks (small discoloration from unidentifiable food on one side). Is it just new, or are people politer with the collective sponge? which seem, by the looks of the identical dirt-rings, to have been used (often) on dishes? Sponge edge against pot (and pot and pot) in a routine & downward scrubbing motion? threaded with Abby-hairs. “Probably” used in the bathroom; Abby doesn’t like sponges for the kitchen (“gross”). Used on dishes until, with the knowledge it was headed for archival inactivity, Josh used it (hard) on the tub. 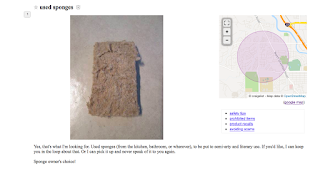 An outlier: Sponge as toy, not tool. Former property of Katie’s 9-year-old neighbor, an “uncharming” child who claims to see ghosts. Found in the sandbox with scrubber pad ripped clean off. which arrived in a small ziploc still damp & flecked with green. Guessed correctly to be broccoli: more specifically, organic-frozen-dinner broccoli consumed during the busy early days of Dorian’s first MFA semester. 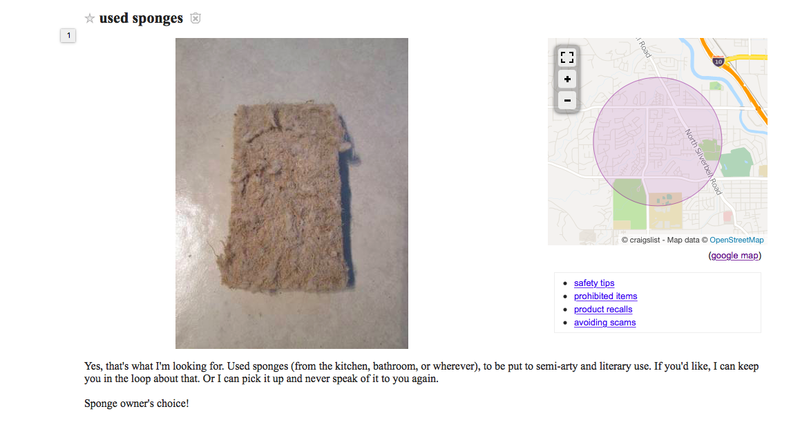 The sponge stank up my whole house ‘til it finally dried out. Donations gratefully accepted. Shoot an email to mirandatrimmier@email.arizona.edu to get the process in motion.